one owner at a time. Do you hate the idea of declawing cats? Do you wish that more people knew how awful this procedure is? 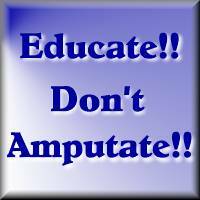 Do you think that veterinarians should take more time with their clients to explain the surgery and what actually happens to their cat's claws? sites that advocate hate of any kind will be added. And no animal abuse sites need apply. Step 1. Submit your site. 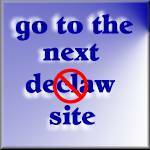 If you have a declaw information page on your site, put that page URL where it says site URL. The URL you use when you sign up MUST be the address of the page where you place your webring code. Step 2. Choose your graphics, from the Graphics selection page. Make a note of the graphics you've chosen and make the necessary changes to the webring code. Step 3. When you have finished registering, you will go to a page where you can find your code. Copy and paste it to your webpage. Don't forget to change the graphic code if you chose a different one. Please place it on the webpage URL you used when you signed up. If I can't find the ring on that page, you won't be added. If you have a declawing information page, please place this ring on that page. Step 4. Email me at webrings@lisaviolet.com when you have it up, so I can make sure everything is alright and add you to the ring. If you need to make changes to your site, you can email me and I can do it for you, or you can go to edit your info and do it yourself.